In addition to my normal publishing channels and RSS, I post on a private Facebook group page called "Miles to Blog." This is a group of active bloggers who write about their training, motivation and races. The writing is uniformly good and some of these people are very funny. I've found it interesting to read what's important to this group of predominantly female runner/bloggers. Please don't take this as sexist, but I'm amused by the one subject that seems to dominate. Is this a runner thing or a gender thing? Can you guess the subject? Moving to a different subject, I got out today for my Hal Higdon prescribed 3 miles + strength run. The strength stuff is still pending. Does carrying the clean laundry upstairs for my wife count? I'm in the fourth week of Hal's intermediate Half Marathon training program, the first formal training program I've ever followed. I've been wondering if it's working and had an interesting experience today that answered that question. 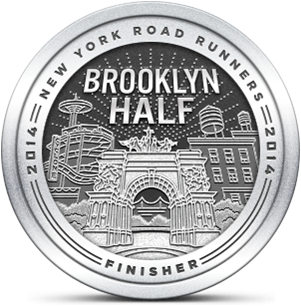 My two challenges for the Brooklyn Half are: 1. Getting my endurance back to the level where I can cover the 13.1 mile distance and 2. Developing the stamina to sustain targeted race pace. The Higdon method involves increasingly long base runs, timed tempos, track intervals and shorter runs. Plus strength training which I'll get to at some point. The idea is to bring the base and speed training together over the 12 week schedule so that the runner is at his or her peak on race day. I was curious to know whether, in the fourth week of this training, I had gained any speed as a result of this long/slow and short/fast run combination. I was in the second mile of today's run when I broke my rule about checking pace on my watch. My Garmin showed an abysmal pace that was disheartening because I felt like I was running much faster. I took up the effort a little, but a few more checks of the Garmin showed that I was still over 30 secs per mile slower than my target. When I checked my time and distance after the run, I saw that, overall, I'd exactly met my targeted pace. One thing I learned was that I shouldn't assume that the Garmin is providing accurate real-time pace information. The other thing I learned was that this training is helping (although it took that scare to get me to pick up the pace). Nothing motivates like progress. I just hope it continues. I'm with ya on working on endurance. I have struggled with mileage this bitterly cold winter! The treadmill has made me too soft. I've never been so happy to be back running on the pavement. Hey! You forgot to tell us the subject that dominates women's blogs!! Which one?? I have NEVER blogged about tutus, just so you know (unless you count loose shorts over running tights....)! Sorry, I couldn't resist. TPP called it - food. Earlier this week I counted food as the main subject in 1 out of every 3 blogs. I would say inspirational themes and race write ups are a close second. Tutus don't seem to come up very often except with that Self magazine story. I hope I inspired women runners around the world to flip the bird to moronic motorists. Yes, that was truly noble of you. Yeah, but today, it could be a dangerous thing to flip one. You never know who's ready to go postal. 30+ years ago, my father flipped the cornuto sign (because hes an italian drivers and thats what italian drivers do) at someone in traffic. The guy got out of his car and came over to my father waving a gun. Postal back then, too. I usually try to call people on their bad behavior (i.e., "Hey you just blew through that stop sign!") rather than gesture. Mostly because these awful drivers aren't looking anyway, they're focused on texting and talking on the phone.